Strawberry plants produce sweet, red fruit throughout the summer months. 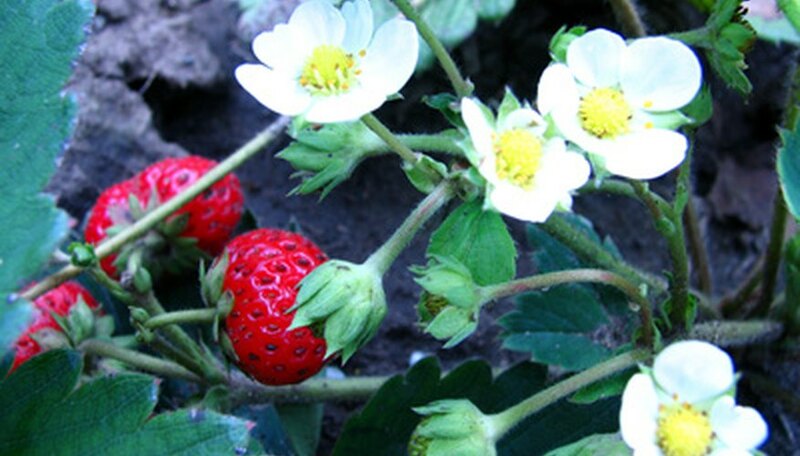 As perennial plants, strawberries survive winter and return in spring to begin producing the next crop. As the gardening season winds down in fall, take time to prepare your bed for winter and the following spring. Proper fall care helps ensure the plants return to their former health after winter dormancy. Much of the effort you expend on the strawberry bed in fall prevents disease and winter damage, and provides for the plants' health. Thin out any weak plants from the strawberry bed, as these likely won't survive winter well. Remove enough plants so that only five plants are growing in each square foot of the garden bed. If healthy plants must be removed, transplant these to a new bed if desired. Water plants regularly in fall, as they are setting the buds for next year's fruiting, advises the University of Nebraska Extension Service. Water once weekly, wetting the soil to a 6- to 8-inch depth. This is equivalent to 2 inches of rainfall. Water throughout fall until the ground freezes. Weed the bed thoroughly so the weeds do not become established in early spring before the strawberries return from dormancy. Break up the soil surface between the plants with a hoe, so any young weeds are uprooted. Cover the bed with a straw mulch after the ground begins to freeze in late fall. Place the mulch on top of the plants so they are completely covered, as the mulch protects the strawberries from winter damage caused by winds or the thawing and refreezing process. Move container-grown strawberries to a protected area in fall once freezing temperatures begin. Place the pots in an unheated garage or shed, or place them in an enclosed porch for protection. Remove fall mulch in spring as soon as the plants begin actively growing again. Do not fertilize strawberries in fall, as this encourages new growth that does not have time to mature before frost. Instead, fertilize in summer right after the last harvest of the season.